Humboldt Park is largely a working-class black and brown neighborhood, according to the 2010 census. A Puerto Rican community sprouted in the 1950s, and thrived. 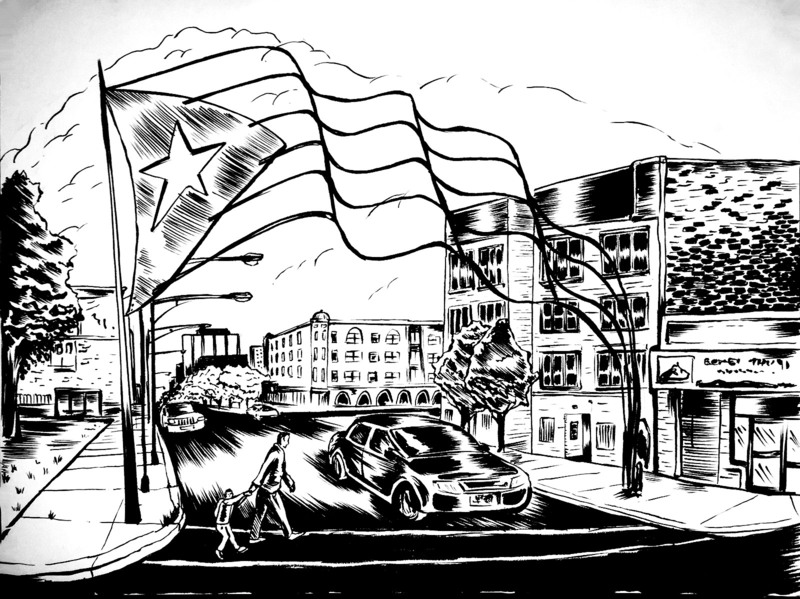 By the mid-1990s, the strip of Division Street between Western and California avenues, in the heart of the neighborhood, was given the honorary name “Paseo Boricua.” Each end was marked by a 60-foot-tall commemorative gateway, patterned after the Puerto Rican Flag. Or do they mark the past? The neighborhood has changed, or is changing at this very moment. By some measures, the new Humboldt Park is thriving. In 2014, the real-estate company Redfin declared Humboldt Park the 10th-hottest neighborhood in the U.S. These days high-end coffee shops have sprung up on formerly gang-run territory at California and Augusta. For some, change brings its own problems. Rising rents forced longtime resident Gloria Burgos and her five children to move farther west, away from the neighborhood she’s identified with all her life. Her new surroundings feel less safe; Humboldt Park may not have had fewer gunshots, but she felt like she belonged there. But old problems remain, including gun violence. Eighteen-year-old Ralphy Garcia, interviewed here, says he’ll be forced to leave as well after a shooting left him wounded and ready for change. "Just shy of my 18 birthday I went to prison for first degree murder. 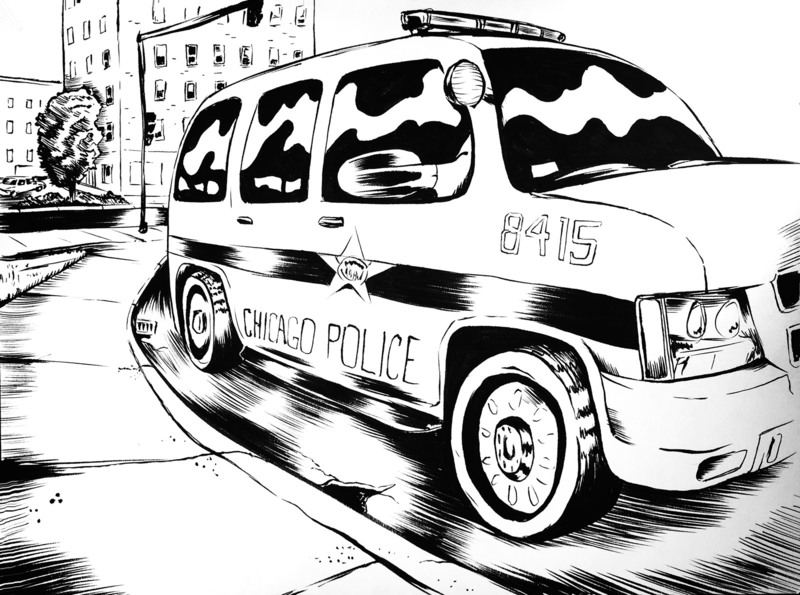 I was in Humboldt Park before I went to prison." My name is Raphael Garcia but I go by “Ralfy.” I’m 18 years old and I was shot at 15 — caught in a crossfire. I was walking with my friend, and we ran into some people that he knew. He said they were cool, so I started walking with them too. Then a car came up, approached us and started firing. It was during my winter break on New Year’s Day 2013, and we happened to walk down an alley. We were there for a couple of minutes when the minivan pulled up. The driver, he shot Alfredo first, and then he shot me. And he aimed. Why? It had to do with gang affiliation. There were a few guys that I was walking with who were gang members. I’m not a badass, but I didn’t feel anything. I had seen a bright light, then I closed my eyes — and as I opened my eyes, the van was still there. He was just waiting to see if I’d drop. I was looking at the van trying to at least get the color and get the license plates — just trying to get something. When he fired again, I acted like I got hit and I fell to the floor. He missed. But he was trying to get me ‘cause I was still standing. I was hit in the chest. One inch away from my heart. But I didn’t even know I got hit at first. I just fell to the floor and when I got up, my friend was behind me like, “Why are they shooting at me? I’m not a gang member” — I told him I can’t answer that. I was in the hospital for five days and I started walking again on the third day. I live in Humboldt Park right now. And I would say there are wild animals out here. Because nowadays, people just don’t care. The reason why I got hit, people were telling me later, was because of an anniversary. It was retaliation for something that happened on the same place and the same day. So I was caught in that. It was just the same day. And just recently somebody died on my block. I’ll usually start hearing from people that there was another guy that got killed right down here and another guy there. I think about it every day, like — that was me. I believe that if I had closed my eyes that day, I would have died. That was why I was trying to stay standing. I was just too scared to close my eyes. And later, sitting on the hospital bed and having everyone come see you — it just gets you thinking deeper on things, like, I might pass. Now I watch myself and where I am at. If anybody is too close to me, I kind of like look at them hard. My mother all the time tells me to watch myself out there on the streets, don’t go hanging out in neighborhoods like that — and I listen to her, but that day I just didn’t think it would happen. Now, I’m about to graduate. I want to go to college but I’m still undecided. I feel that at the moment I just need to get out of here. There’s just no point in being here, but it is my hometown — and I love my hometown. But I need to go where there will be opportunity. To honest though, I was already now going down a bad path. I noticed it myself because of the people that I was hanging out with. But you can’t go back. I was starting to notice that I was going down along the pathway. I was hanging around that evening. I was already noticing it. I was trying to catch myself but I felt that it was too late, but it wasn’t. I’ve been doing the BUILD [Broader Urban Involvement & Leadership Development] program this year. We get to go on a couple of field trips to different colleges. Just a while ago, we were doing some peacemaking about domestic violence. We talk about that and we see if we can piece that out, you know, try to bring that to the community. Just shy of my 18 birthday I went to prison for first degree murder. I was in Humboldt Park before I went to prison. There was an altercation with some female friends that I looked at as sisters at the time. They went out and, as they were coming back, some of the guys in the neighborhood were trying to talk up on them. So when they said ‘no,’ the guys began to jump on them. So when we heard about that and, of course … we retaliated. When they come to my buddy, he and my victim began to fight, and this is where my recklessness comes in, because my friend had a gun. I took the gun from him so that he wouldn’t do anything stupid. It was an altercation, it wasn’t directly gang related; it is truly one of the most senseless and reckless cases that you could come across. As the crowd dispersed … I went down the street, the same as my victim did. He couldn’t keep going forward, because there’s trouble ahead of him and then there’s trouble on his heels. I fired six shots … and two of them hit him. The full scope of consequences, I would say, had eluded me. I wasn’t a dumb kid, I wasn’t a kid that wasn’t loved or anything like that. It was my own personal choice, but it still came from a very limited understanding. I was, how do you say, a city boy — and I was on my way to the country. For 18 years and 9 months. Still not even a legal adult; sitting in prison, angry. I can’t point to one specific event or a time and say ‘this is when I decided to quit everything, quit negativity and go forward.’ But it definitely happened, and it evolved. Can you imagine a guy having committed murder and feeling like he’s the victim? Feeling like society and life and everybody else had wronged him? But at the end of all that, there’s still no erasing my crime, and the more I come into who I am as a person the more that man’s blood cries out to me in a way that’s hard to explain. I completed my GED, and then I started to get involved with what they call cultural awareness programs. When I started doing yoga we named it Yoga at the River, because we were in the Illinois River Correctional Center. It became a uniquely popular thing. And so when I see this still senseless violence, my head, so to speak, is still in that. It’s this perpetual cycle, literally like drops of water in a bucket. But when you have collective drops of water in the bucket, it’ll will fill up. All of our decisions are drops of water in the bucket. It’s a weird and surreal experience … for me to be able to go back inside [the prisons] and teach. But this is where we get our legs back in the community: helping people come back to that core of themselves. Healing people, their minds and their bodies, and helping them elevate their spirit. I’m really hopeful for the lifestyle redirection inside the jails, because I think that’s the kind of untargeted group of society that can plug up a lot of the violence. If enough people play a key role in the solution, we see a significant impact. So what do we do? When we say ‘a second chance,’ what does that mean? What do we set up for them that are coming back? And for the people that are already here and never left? I have lived on the West Side pretty much … for the most part of my life. When I was small my mom moved out to the suburbs, and I came back to Chicago every weekend to see my family. And then in high school I experienced my first moment of gun violence — I think I was in 9th grade. I was talking to a guy from Douglas. He was my first boyfriend and he got killed. So I actually moved to Michigan with my father for a couple of years. I finished high school there then I came back to Chicago. My uncle bought a building on Hamlin and Chicago and at first I was like, ”Do I really want to go back?” Because during this time a lot of people I knew had gotten killed. My cousin got killed in 2011. Before then I had spoken at a funeral of [another] of my cousins, him and his friends was outside — they was playing with a friend and one friend accidentally killed the other. So that was the first time I spoke at a youth funeral. I’ve spoken in several youth funerals since then. I’m the secretary on the Kells Park Advisory Council. And I [organized] my first Stop the Violence Parade in 2012. 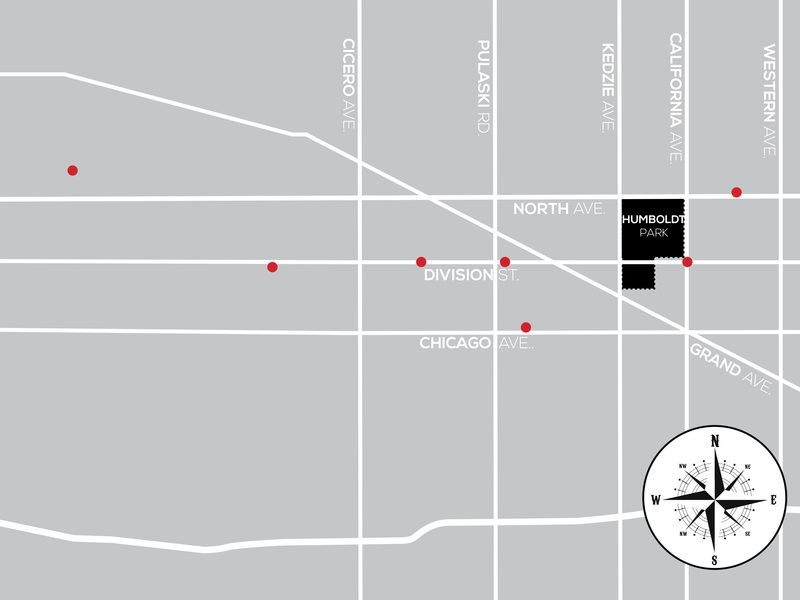 It’s the one we do from Pulaski to Kedzie, starting at Orr High School and ending right here at Kells Park. We did three so far. It’s a day of peace, just letting the community know that we can come together. I mean, I wish I could see that every day. I want to let the kids know that there’s more — some of them have never even been downtown. Right here in Chicago. Imagine being so hungry and thirsty for something — but also knowing that it’s within your reach. I could describe Chicago Avenue because that’s what I’m familiar with. It can be dark over here. I try to meet people where they are, and love on them like, “I understand what you’re going through” — because I really do. When people used to die, I’d be really, just torn apart, you know what I’m saying? And now I’m not torn apart. Now it creates a strength to do something about it. Just teaching people that once you pull a trigger on somebody, they’re not coming back — I think people do it, but I don’t think that they actually realize the impact. The work that I do for kids was started out of a need. Because I know people do toys and things like that but a lot of people who are in need are in need of stuff like bed sheets. So that’s why I started the breakfast, and this is our third year doing that. It comes from being an advocate and wanting to transform the lives of people. When my cousin died I wanted to help a mass of people. I think that’s when it hit me that something had happened … and that I could turn it toward a positive life. I think that’s when you really get close to home. I wanted to reach out. If I could have whatever I wanted I would create a safe haven for kids of all ages; not necessarily to tell them what to do, but to show them what to do. I would have a place outside the school that would stimulate and educate kids to a higher quality of life, a more abundant life … prepared to be a successful person that’s optimistic in life. That’s what I want to see. Well, it’s like an old saying: I was forced to move west. If you come somewhere new and there’s so much crime and violence, but you don’t know your whereabouts, you don’t know the people … it’s a little bit scarier for me and my children. Humboldt Park felt like home, it’s a difference. You feel like you’re home and you know your own community. I came from the island, you know that right? When I came over here, it was like a different world. I saw buildings, I saw a lot of people, dark colored — I saw a mixture of different races. People were friendly; everybody was out and they’d open the fire hydrant. It used to be a fun thing; guys dancing, girls hip-hopping on the street, playing with skateboards. Puerto Rico is somewhat like that, but it was just different over here. And you know, my brother got into the game, because, you know … it was nearby. Back in that time, in the 1990s, they would force you to become a gang member. Over here they force you to buy a bag of weed. It was just different, but I never felt threatened, even when gunshots were happening or the buildings were burning up I felt safe, to be honest with you, I felt safe and I felt like I belonged there. Over here, it’s just like, they don’t want you to mess with the territory. I said to my son to go get a gallon of milk right here, the store is like three houses from me, and he comes back like, “mom” — he is 15 — “Mom, they’re coming to me talking about ‘sawbucks’ or something.” It’s drugs. It’s all different — it’s a different language. At nighttime I am here with my ears and my eyes open because I’m a single mom. The last thing I want is for my windows to be busted, my car to be busted … anything. I put cameras all around my house. And I’m glad I’ve got the front porch, I love it, but there’s no TV in my living room. I made the basement the family living room. So my goal is to stay in the back [of the house], since I was already warned by the next-door neighbor. I have to take the precautions because, believe it or not, it doesn’t have to wait for summer — it’s already happening. And I love my kids so much, I would hate to have something happen. I’m out of my zone over here, and you know, that’s why living in Humboldt Park felt like a home. But I am still working with Humboldt Park, and I’m still going to be faithful, even though I’m not in my area. My goal is to, hopefully, purchase something in Humboldt Park. Because I really do feel pushed and dislocated from my roots, from where I’m from. Like I said, I used to be able to send my kids out and they’d run all over Humboldt Park. But the first thing my son did — when he got into this new house — was unroll that [Puerto Rican] flag and put it in his room. And you know how proud I was, how he broke my heart? That’s the first thing he did, before setting his bed, was to put that flag up there. And then my other son went downstairs and did the same thing — he put a few flags here and there — because we’ve been there, you know? I’ve lived here my whole life — 37 years. And I’ve been aware of it since 1985. My father said back when I was a kid that neighborhoods go through 30-year cycles. That it always changes. He told me that when I was a little kid and I see these things now, but I also see the effects of erasing history, which is, as someone once said, the greatest violence of gentrification. When I talk to people on the ground that are experiencing gentrification, my experience is different than other people’s experiences. My experience is, I’ve seen gentrification from 1985 till now, and I’ve seen its march west. My grandmother would take me out in a Radio Flyer down the middle of Clybourn and there were no cars. No cars. You could just walk down the middle of Clybourn. And here’s the crazy thing. No one in their right mind would have imagined that Logan Square would be what Logan Square is becoming or what it is now. Listen, I struggle these days. And this is where my big struggle is: to let Logan Square go. I mean, I was born in Logan Square. And that’s why I keep pushing west, west, west of Pulaski — to plan way ahead of time. So if you want to talk about the difference between this and Humboldt Park, you have to look at it from a historical context. It’s in how you talk about your space. Some people have the power to put it in print, some people have the power to create maps and put it out online and brand their spaces. Other people, let’s say you start the Maniac Latin Disciples right on this corner — they’d call that Grand City. You have all these different people and they brand their spaces and protect their places. But I think that we have to be aware and we have to be vigilant against “East” vs. “West.” Humboldt Park is Humboldt Park. People around the neighborhood like to say, “Yeah I’m from Humboldt Park, I live in West Humboldt Park” and that extends all the way to Pulaski. Then you have all these other groups that create the names. They’ll section out Humboldt Park as East Humboldt Park. Pulaski is rebranded as West Humboldt. The crazy part is that If you go all the way back in history, I mean, to the founding of Jamestown — to our first English settlement in America — it was founded not because they wanted religious freedom but because it was a way to make money. And then the native people that were living there, they don’t have a concept of private property. And as colonialism and western expansion happens it ends up being perpetuated over time. The violence is not murder. The violence is psychological — it’s like my memory is being erased. My memory over this space is being erased. It’s gone and you can’t convict someone of doing that. And so this is how the violence perpetuates. We don’t take over countries anymore. We dismantle their towns. The thing is that whomever has the power to create the narrative over a space has the power. If you could change the narrative of Humboldt Park to reflect your interest, and if you’re very powerful or your people are very powerful, then you can change it — that’s the violence. We’ve been Cup and Spoon since May of 2014, so we’ve been here eight months now. I started it, and then my brother Frank was huge in helping me get up and running. He was with me from the start, and now my younger sister works here. So it’s the three of us. And I’ve been in Chicago almost five years now. I was in Brooklyn before moving to Chicago, and I loved my neighborhood. It was diverse and had a lot of culture. It had a lot of energy and small business. And when I came to Humboldt Park I felt like I was back in that city life; smaller shops, more energy, more … different, vibrant; I loved it. I always considered myself living in Humboldt Park, and then you cross Western Ave. and it is Wicker Park. And then the Pizza Hut is Bucktown. So it’s a very interesting intersection. I lived east of Western before, and I’ve been west of Western now for two and a half years. I feel there was always a division, or a line. I think 10-15 years ago Ashland Ave. was the street that was like, ‘You don’t want to go west of Ashland.’ I think Western then became that divide for whatever reason. It was always ‘West of Western,’ that was that phrase people would say. And I never really thought much about it, in terms of a barrier or divide that I didn’t want to cross. So in speaking with Lynne from An Orange Moon in the very early stages of our little, unofficial, Neighborhood Business Association … I was just like, ‘What about West of Western?’ Because that was something that had always stuck in my head as an acronym — so, the “WOW District: West of Western.” And we liked that there was pride in it. Where some people might attach a stigma to going west of Western, there’s this sense of, ‘No, it’s an amazing neighborhood.’ The WOW District came out of that conversation. I think we’re trying to find a unified voice. I met with a few people this summer who showed me a book they put out on the history of Humboldt Park; which shed a lot of light on it for me, on the space and the neighborhood. It talked heavily about the Puerto Rican culture and presence in Humboldt Park and how the neighborhood was built up all the way to Paseo Boricua … so I would say that Humboldt Park is full of culture, it’s very vibrant and community focused. And I feel that support. I’ve had a dream forever to open a coffee shop, and I feel like it’s really hard, because so many people, when they talk about gentrification, say, ‘Now there’s going to be a coffee shop in the neighborhood.’ And I’m like, ‘No, it’s a good thing!’ — it’s a community center, it’s a place to bring people together, it’s a place for artists and for people to work and meet and communicate, and for neighbors to meet when they may never run into each other again. So really, for me the idea was the hub in the coffee shop. It’s nice to see people come together. I have such a strong connection to art and the effect it can have on everyone as an outlet. I think art, poetry and spoken word gives you a voice, and it means that no matter what, you will be heard. And I think for changing violence that’s a huge outlet — giving people a voice and creating events where they can be heard. My parents, looking for better life for us back in 1971, decided to move to Chicago — to the heart of Humboldt Park — when I was four years old. So I have been here my whole life. Forty-four of my 48 years. It is still somewhat the same if you look at the old way Humboldt Park was. I grew up with the traditional Puerto Rican families. My parents rented an apartment at the corner of Evergreen and Washtenaw [Avenues]. It was a big brown building; I remember it went all the way from Evergreen to Potomac Avenue, the middle being a big courtyard. We lived on the Evergreen side, on the second floor, right in the northeast corner. There was a storefront there, and one day I remember looking out the window — there was a gentleman that had just walked out of the store — he lived a few doors down west of us. I remember a car pulling up, speeding, and coming up to sudden stop — as if it happened yesterday — a man sticking half through the window with what appeared to be a revolver led to a couple of rounds of shooting, and the guy dead, right outside of the store. I was looking out the window at five years old. I guess at the time it was just part of life. I saw my second homicide at seven or eight years old. It wasn’t uncommon for us to see the guys out there strung out on drugs. It wasn’t uncommon for us to see a dice game on the corner that would erupt into a fight. It wasn’t uncommon for us to see the police come and round everybody up for illegal gambling. It was just part of the nature of the neighborhood. I felt safe because we grew up over there. This was home, this is who we knew. I became a policeman because it was something that I always wanted to do. When we were kids we played cops and robbers, and I was always the cop. It was something that I believe was my calling and it’s something that I accomplished. Now, I was a little salty because I wished I had gotten on the job at 21, but I have no regrets because those job experiences and my life experiences allowed me to transition to the police department with some knowledge. I became a policeman in 2000, 15 years ago. And I have been here my whole life so I’ve got a good rapport with the community. I am one of those guys who believes in giving people not only second chances but third and fourth chances. A lot of times I’ve had to arrest people that I went to school with, they were my homies. It’s not personal, it’s just business and they know that. So I feel quite comfortable running into somebody who I haven’t seen a long time and embracing him. It doesn’t matter if you are all thugged up or if you are wearing a religious collar. At some point in life we cross each other, so why should I judge you. But this community is challenged in a lot of ways. And, as a result, Humboldt Park offers a lot of community outreach service. But first of all people have to be willing to seek them and accept them. But there was a 13-year-old girl shot in the schoolyard — you know who I’m talking about? Schanna Gayden. That was my arrest. I got the two guys who were responsible for her homicide. And, you know, I say hi to Schanna every day I walk past the park. It was right down the street from my house. She was a little girl almost the same age as my daughter, just minding her our own business, enjoying a nice summer day behind the school yard. What worse place to die than behind two things kids need, you know? School to learn and a playground to play. To get shot in the school yard — that’s sad even for a senseless crime. No, all homicides are senseless to me. And Humboldt Park is home to me. I’m one of the children of Humboldt Park. I’ve been here my whole life. I met my honey here. I met her at the neighborhood high school and to this day we are still together — over thirty years. We are raising two kids here. So I’m not going anywhere. It takes me three minutes to get to work. One thing that’s important to remember is that it ain’t about you talking. It’s about listening. You come to know the block. You come to know the people by name and you know where they’re at. We moved here in 1991 and the reason why we moved to this area was because the houses were cheaper, and it was the only thing that we could afford at that time. I didn’t know the neighborhood much. I didn’t realize that it was as dangerous as it was, and the neighborhood was, I would say, a good deal more dangerous than it is now. Around that time, I was mugged and very seriously injured. This was back in ’94. Well, when I was younger, I tended to be ‘up in your face,’ you could say, if there was some kind of a problem. One day there were some boys who were throwing water balloons at people and cars on West Division. Some of us over there took the water balloons. These kids must have been maybe 12 or 13 years old, but there was one of them that was a little bit older. He took a bus stop pole … which was lying in the alley … he threw it and hit me in the head like a spear. He was 15 years old. I was unconscious. And — this is something that I understand from what I was told afterwards — I almost died. I don’t feel a particular anger towards those who perpetuate violence in my community. I’m impatient. I want them off of my corner. And other people who live on the block feel the same way, and that’s what makes them susceptible for organized kinds of action. And where does it lead? Well, the last demonstration we had was 120 people. Because I think when you have two murders on the same block in one month that qualifies as a crisis — it’s the kind of turnout you don’t see unless there’s something going on. In the course of the meeting, there’ll be songs or spirituals, then people will talk about their own personal experiences. Some of them have lost relatives or friends to violence. It makes you realize that the people who are there, most of them have been touched —I’m saying the majority of them, easily more than 50 percent of them, have been touched by violence. What the demonstrations accomplish, as I look at it, is building relationships. When you, say, have a relationship with someone, it’s more than just having their name. It’s got to be something that happens. And when in a period of crisis … when we face danger together, where some of us have been injured by this violence — when that happens, you come together. And you don’t have to wonder if you’re doing the right thing. You just know what to do, simple as that. We got a problem, we got a couple of murders, we’re going to have to organize this. Then, at the end of the action you wonder what is the effect of this and where does that lead. That’s where, I’m afraid, I don’t have a clear answer. But I would say you can’t just stand around waiting for the Messiah. I’m 54. I see [my daughter] and her husband, and they live in the neighborhood now. She is about the same age as I was when I moved in there. I’m proud of her, but at the same time I think, it would’ve been nice if she wasn’t fighting the same fight as I did. 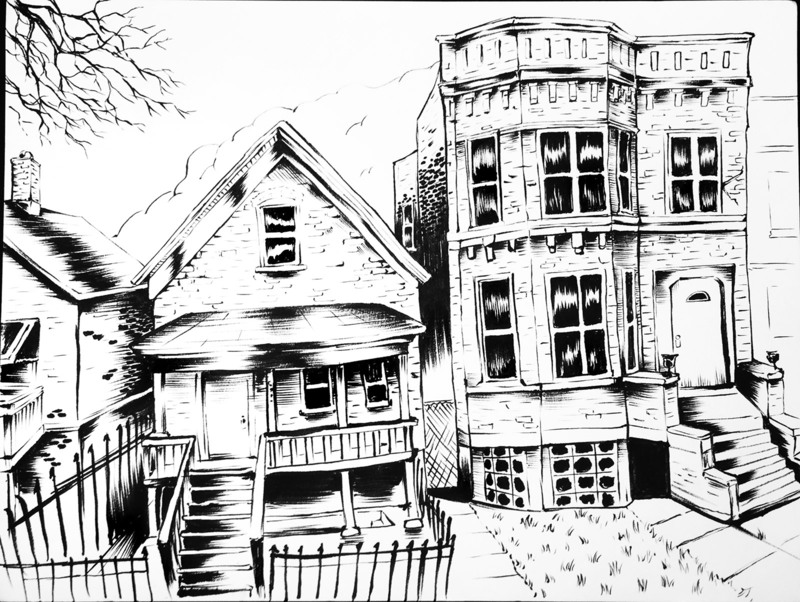 This webpage contain a set of as-told-to interviews from eight current and former Humboldt Park residents over the course of three months — winter 2014/spring 2015. Interviews conducted by Darryl Holliday (Illustrated Press) and Brian Herrera (Attitude Seven) were transcribed verbatim with minor edits for style, grammar and readability. 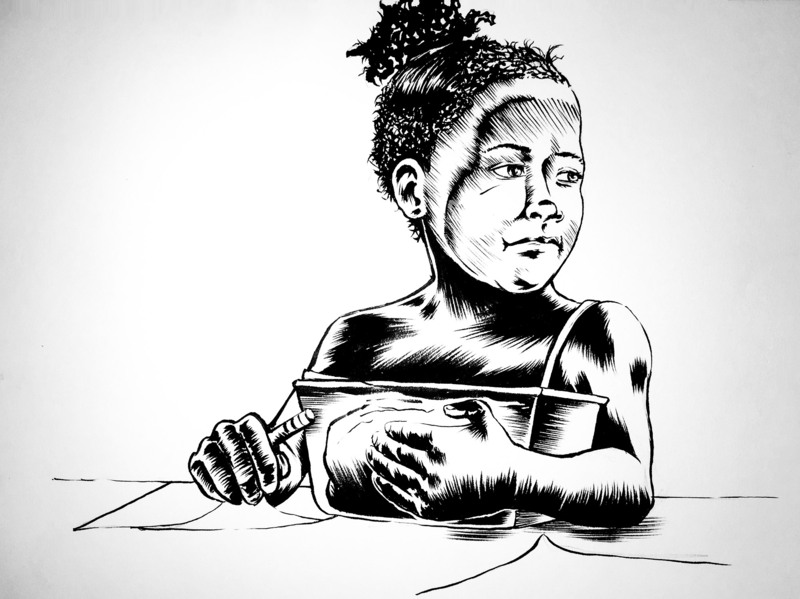 A portrait design by Herrera was then created for each subject based on each interview — the result was a collaborative work the two exhibited as an art installation March 16 at Cup and Spoon Café in Humboldt Park before a crowd of around 40 students, community artists and activists. The booklet, illustrated and designed by E. N. Rodriguez (Illustrated Press), weaves together Herrera’s portraiture and design, Holliday’s graphic reporting and firsthand accounts of violence — and solutions to violence — in Humboldt Park from the 1950s to the present day.